Yesterday I was afforded the opportunity to head down to Josie Bones in Collingwood for an exclusive look at the Australian International Beer Awards menu for the presentation dinner to be held in May. The AIBA, now in it's 20th year, is bigger and better this year with a record 1,352 beers entered. The event was aimed to showcase the menu, designed by Chris Badenoch a former Masterchef contestant, for the AIBA presentation dinner. Assorted media (including me for some strange reason...) were joined at this event by 3 of the AIBA judges for this year, who were going to go through a mock judging at the conclusion of the food tasting. First up we were served a trout and spanner crab riette(?) matched with the Bootleg Brewery Sou' West Wheat beer. This combination worked really well, the beer is slightly spicy and was the Champion Wheat beer from last years awards. My favourite dish was the spiced pork belly served with a pickled peach on top. It was delicious even before being matched with a Feral's Hop Hog, one of the best IPA's in Australia, which really brought out the sweetness in the pork. 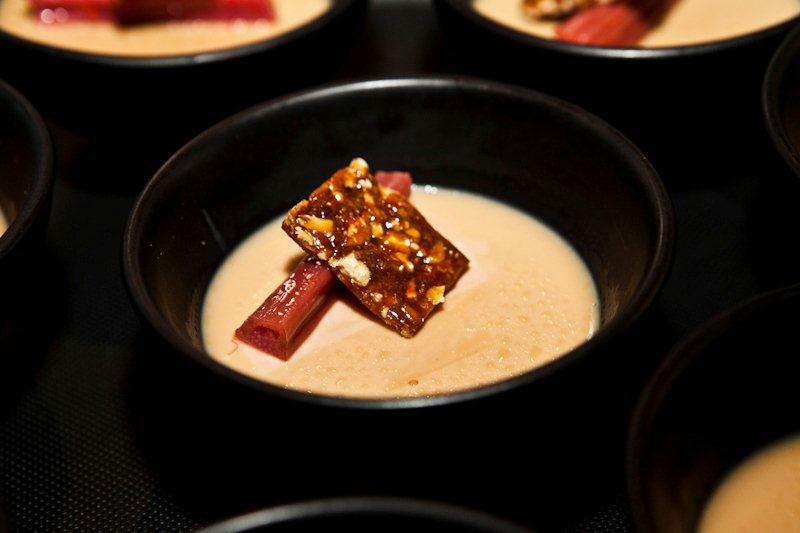 For desert was a lovely caramel and stout pannacotta served with rhubarb, on the night it will be served with raspberries. This was matched with one of my favourite stouts, Renaisaance's Craftsman Oatmeal Stout, which also goes into the pannacotta. The texture was fantastic! The only thing that I will say about this is that it may be a waste of a fantastic beer putting it in this pannacotta. At least I got to have some! This dinner is going to be fantastic if this sneak peek was anything to go by. My favourite part of the afternoon was the mock judging, run by AIBA chief judge Peter Manders with Anders Kissmeyer (of Nørrebro Bryghus fame and his new brewery Kissmeyer) and Masayoshi Kaji of Japan. All three are experienced beer judges and they all gave good insight into judging beer and also Anders said something that I think will help all people in tasting new beers, which I will share with you in due course. Each beer is judged on 5 different criteria, and it's very similar to my system which was vindicating. These 5 categories are appearance (3 points), aroma (5 points), flavour & body (6 points), style (3 points) and technical quality (3 points). The first 3 should be pretty self explantory while the last 2 are slightly more complex. The style section is how appropriate this beer is for the style it's been entered in and the technical quality section is the absence of faults and the drinkability. Medals are then awarded based on these scores. The judges have the ability to move beers into a new style bracket if they feel it would be a better fit. We 3 beers with each judge taking a turn to explain what they were tasting in each beer, the highlight of these was clearly the black IPA, which was of exceptional quality. It had great bitterness without burning the back of your throat. We were unable to know the names of these beers, as they were all still to be judged. It was a great insight into the judging of beer. At the end there was a Q & A session, where Anders Kissmeyer said something that really struck a chord with me. His advice was to all beer drinkers, whether experienced or just starting out. It was quite long winded so I will paraphrase, his point was that as we all taste things differently it doesn't matter what we call each individual part of the beer we taste. As long as we label that taste in our heads and remember what we call that particular taste and that way we can work out what we like, and then the correct terminology will follow. I think this advice can help more people who don't really understand beer to learn what it is about beer that they like. The judging on the Australian International Beer Awards has another 2 weeks to run, before results are released at the dinner in May. I would highly recommend people getting tickets to the World of Beer event which will be held on Friday 18 May starting at 4:00pm which will showcase the best beers from the competition. Also everyone in Melbourne should head down to Josie Bones in Collingwood and check out the amazing selection of beer and food served by Chris and his team. If this event was anything to go by the presentation dinner will be amazing, the judges have a huge task on their hands in picking the winners.